Megan Kelly with Patch Whisky and Dustin Spagnola. Burners & BBQ 2016. Asheville, NC. 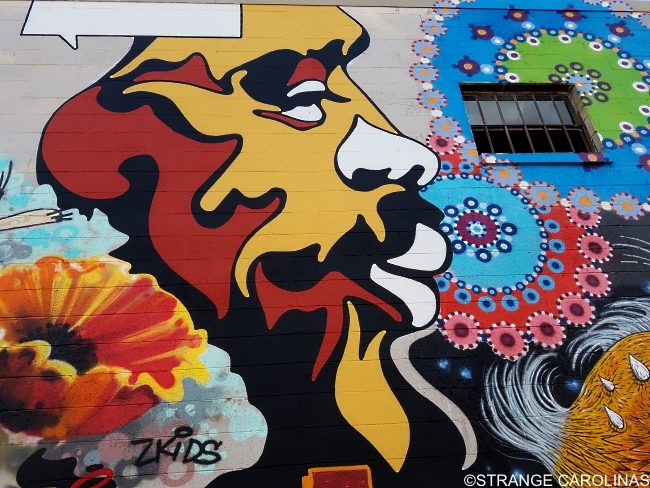 When we started exploring the Asheville mural scene, we immediately noticed beautiful, symmetrical designs everywhere. We learned they were by Asheville artist Megan Kelly. 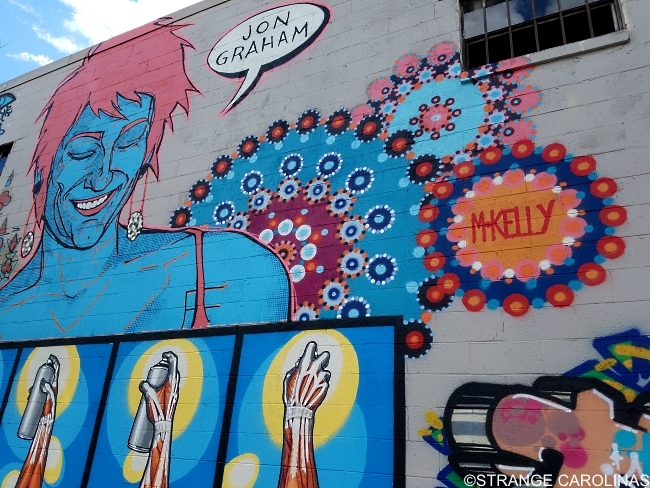 We tracked down Kelly and asked her about her art, murals, collaborating, and future plans. Tell us about mandala and how you got into it. I started making these circles maybe seven years ago. They started more asymmetrical but have become more detailed and balanced the more I make them. I can't quite remember who first coined them mandalas, but it wasn't me. However, when they were described that way, something clicked for me. It was exactly what I wanted my art to represent. Balance, symmetry, and harmony is key for my creative process. Megan Kelly with Jon Graham. Burners & BBQ 2017. Asheville, NC. First mural -- what, when, where, and is it still around? This story is pretty funny actually. My first mural was painted at the Mecca of all mural events, Art Basel in Miami, Florida. 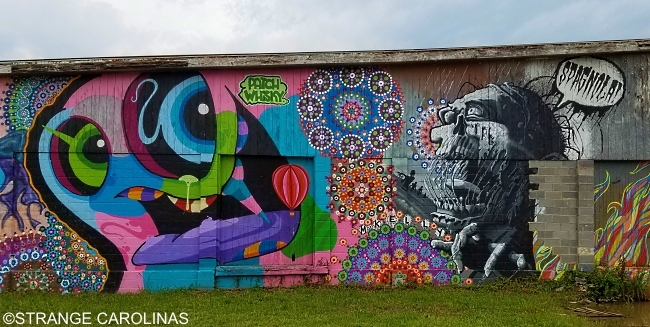 I had gone down with some friends to see what it was all about and was completely blown away) And as luck would have it, a friend managed to talk a business owner into letting me paint the outside of his building along with another painter friend of mine. Long story short... it was a disaster. I had no clue what I was doing and was completely unprepared for the amount of work I had in front of me. Nevertheless, we finished after two long days and managed to have a standing piece in Wynwood for about a year that got covered up eventually. It most definitely wasn't my best work, but it was a fantastic learning process. Megan Kelly at Burners & BBQ 2017. Asheville, NC. Photo courtesy of Megan Kelly. What has been your favorite piece you've done so far? That's a tough one, but I'd have to say my favorite piece is probably a mural I painted a couple years ago in St. Pete. That was the first mural I found and painted completely by myself so it was a pretty liberating experience. What do you look for in a space to paint? With public art, the first thing you usually look for is visibility. 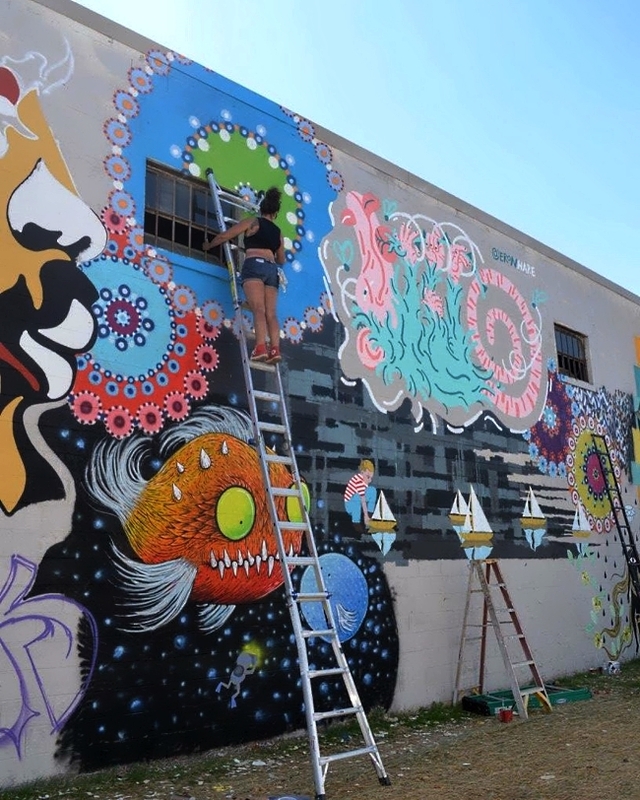 If you're going to paint for free (and a lot of murals are), you want to make sure they are visible to the public eye. Exposure is always my first goal. Other than that, having a somewhat flat surface to paint on is always nice. Megan Kelly with Dustin Spanola. Hopfest 2017, Tracks Bazaar. Greensboro, NC. You do a lot of collaborations -- how does that work? I've definitely done more mural collaborations than not. My partner, Dustin Spagnola, and I work a lot together. I really enjoy the creative process of two artists coming together and blending techniques. It's always an exciting and satisfying experience seeing your work come together with someone else. Which artist would you love to collaborate with? I'd love to work with tons of artists! I think Swoon's work is really incredibly beautiful. And I love working with other women artists. So that's definitely up there on the list. Megan Kelly with Lady Huns. Foundation Walls, 2017. Asheville, NC. Have you ever thought about turning your art into textiles or fashion? Making textiles from my work is on the to do list. I have dreams of tiling rooms with my designs. Just haven't gotten that far yet. It will happen sooner rather than later hopefully. I'll keep you posted! Megan Kelly. Burners & BBQ 2017. Asvheville, NC.